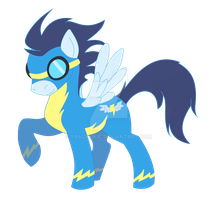 Daww, Soarin when he's galloping! *Trotting actually, but still cute. You're right, he looks more like he's trotting! Galloping is a bit faster, like a run...while a trot is...and now I'm going on about horses...LOL! 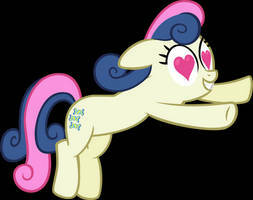 What is his official cutie mark? Well, up until today this was his official cutie mark, but today's episode gave him a brand new one so this is now out-of-date, unfortunately. I love Soarin my favorite of his lines is MY PIE!!!!!! Now make one of him with pie!!!!! I still don't get why they tried to harass "Omega Spike" like they did. Aside from the King Kong reference it provided. They didn't even attack him in any particular way. They just shaved off some spikes. They should just stick to sport racing.